St. Patrick's Day celebrations unfolded across America Saturday, led by the nation's oldest and largest parade which paused for a moment of silence to honor the dead in a city healing from terrorism. As bagpipers played the last chords of "God Bless America," thousands of marchers and hundreds of thousands of spectators along Fifth Avenue faced south in silence toward where the World Trade Center towers had stood. "Many of those who were lost on Sept. 11 would otherwise be marching proudly. ... We know their spirit marches with us," said Ireland's president, Mary McAleese, who joined the New York parade for the first time. The parade, and others like it across the country, was filled with small, poignant tributes to the victims, but it also carried the usual sprightly twists of Irish humor. President Bush marched with politicians and firefighters in Chicago, a city so Irish it dyes the Chicago River green for the occasion. "People are generally good and fun-loving and they need little reason to show it - this day has a lot of tradition about being a happy day," said Steve Healey, 33, an engineer who ran in a pre-parade race Saturday in Rochester, N.Y., carrying an Irish flag. Parade organizers in Wenatchee, Wash., counted on keeping tradition alive with a no-show Sunday from their invited grand marshal - former Enron Chairman Kenneth Lay. It's a standing joke of the Loyal Order of Hibernians there to choose a national newsmaker who is unlikely to appear. Past no-shows include White House intern Monica Lewinsky and Filipino dictator Ferdinand Marcos. In a shot at the New York City Hibernians' refusal to allow gays to march in the Manhattan parade, Key West, Fla., bucked the traditional St. Patrick's Day green in favor of "the wearing of the pink." An estimated 300 to 400 people in pink beads and fedoras were expected for Sunday's "Pink Paddy Celebration." Gays in New York held a small protest Saturday during the parade. In previous years, the controversy has dogged New York politicians who traditionally join the parade. This year, another controversy emerged over how best to honor firefighters. Parade organizers decided against letting a fire engine lead the parade, but agreed to honor the victims with the moment of silence. By the time the "Fighting 69th" regiment of the New York National Guard took its post at the front of the parade, the controversy had receded to the background. Among those joining McAleese and Mayor Mike Bloomberg were Sen. Hillary Clinton and former Mayor Rudolph Giuliani. Giuliani spoke of the Irish Americans among the firefighters and police officers lost in the Sept. 11 attacks. "On that horrific day when special sacrifices were asked of people, nobody exceeded the Irish," he said. 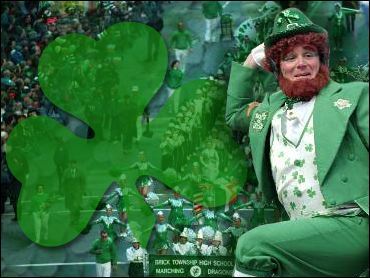 In Boston, where 23 percent of residents report Irish ancestry - the highest percentage in the nation according to the census - the big parade was scheduled on St. Patrick's Day, Sunday. "It's important to get out and celebrate," said Terra Larkin, who marched Saturday in a parade in Denver, "to know that life will go on."